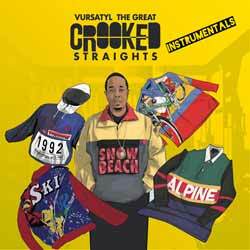 Portland based rapper and singer Vursatyl releases an instrumental version of his 2015 album Crooked Straights, via BBE. It's pretty much a given that if you enjoyed the original you'll get a huge kick out of this too... but more interestingly, with the vocals removed, it somehow adds extra depth to the original. With the vocals gone the music takes centre stage and it's surprising how much more complex and engaging it sounds. The original album was mightily impressive, but this new angle makes it sound like a totally new release. Tracks like 'Super' are hypnotically monotonous, whilst 'Bring it to a Halt' is an engaging, toe tapping, thematic piece. 'High Horse' has a funky disco vibe that's hard not to fall in love with. The album contains 10 tracks (33 min, 27 sec) and for those that loved the original this is an essential purchase.